Despite advancements in mechanization within US agriculture, some menial jobs are still best left to human workers. Problem is, federal crackdowns on undocumented laborers have decimated that workforce. The Harvester automaton could provide a cheap, readily available labor force without the threat of raids by the INS. The US agriculture industry is worth about $300 billion annually—half from livestock production, the other half from crops. However, some of the most basic jobs in this industry still have to be performed by people. Jobs like offloading potted plants from trucks, arranging them in rows for the growing season, then loading them back onto a truck when they’re ready for sale. That may not sound very difficult, but when performed on an industrial scale, it becomes a mammoth task requiring a huge workforce of low-productivity manual laborers—today largely comprising undocumented migrant workers. However, some analysts estimate that, by automating these sorts of tasks, a firm’s revenue per employee could be increased from $40K per employee vs. $175K per employee—an annual labor savings of $21 billion. “We’ve recognized the need for robotics in the nursery industry for moving pots because it’s one of our highest concentrations of labor use,” said Tom Demaline, president of Willoway Nurseries, Inc. in Avon, Ohio. And that’s where the Harvest Automation robots come in. These rolling, knee-high machines have an extendable gripper arm and tray for grabbing and carrying plants as well as a simple sensor suite for navigation. Instead of employing complicated and expensive GPS navigation, the Harvesters use sensors to detect boundary markers, a laser range finder for seeing the plants in front of them, and a gyroscope for dead reckoning navigation. 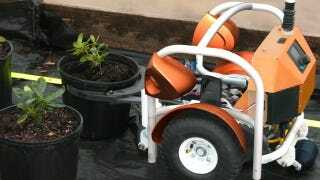 To operate them, the user first positions the robots in front of a grouping of plants. He then uses a touchscreen interface to input how far to move the plants and how to space them, and the location of the boundary marker. And that’s it—the robots will then automatically pick, move, arrange, and place the desired number of plants as the user instructed. These robots are expected to retail for between $25,000 and $50,000 per unit, though those numbers will obviously diminish as the technology gains a foothold in the industry. And even at that price, these robots are “much more efficient than the human workers, so we’re going to save [nurseries] money just on the unit cost to move a plant,” said Harvest AI’s CEO Charles Grinnell. What’s more, future iterations of the robots will be able to scan each plant as they carry them and generate individual data profiles of every plant in the nursery—an extremely labor-intensive task that has to this point simply hasn’t been cost-effective enough to implement. But, with an automated workforce, nurseries will be able to better manage their use of water, fertilizers, and pesticides. Harvest AI also plans to eventually expand the robots’ capabilities to allow them to work in other industries like warehouses, construction and mining.